Standing just off I-81 and 3.5 miles from downtown Christiansburg, this hotel features an indoor pool facility. Free Wi-Fi and a daily breakfast buffet are also offered. Cable TV, a microwave and a fridge are found in each decorative room of the Holiday Inn Express Hotel & Suites Christiansburg. A coffee maker and a work desk are also included. Guests of the Christiansburg Holiday Inn Express are welcome to enjoy the on-site fitness room. A business center and 24-hour front desk service are also available. Virginia Tech is 10 miles from the Holiday Inn Express. David Bissett Park is 20 minutes away. This hotel is in Christiansburg, 12 miles from Virginia Polytechnic Institute and State University. It has an outdoor pool, and offers spacious rooms with free Wi-Fi, and cable TV. Rooms at the Fairfield Inn & Suites Christiansburg have a well-lit work desk and a sitting area. Suite rooms feature a media center with TV, CD player, microwave, and fridge. In the morning the Fairfield Inn serves a continental breakfast with cereal and fresh fruit. The hotel has vending machines, and offers a local restaurant dinner delivery service. The Fairfield Inn & Suites Christiansburg is 15 miles from Dixie Caverns and 30 miles from Niday Place State Forest. This budget-option motel is located 1 mile off Interstate 81. It features free Wi-Fi access and cable TV in every room. Virginia Polytechnic Institute is 15 minutes’ drive away. 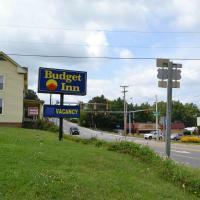 The Budget Inn Christiansburg offers a microwave and a refrigerator in every room. They are decorated in bright coloured bedding and wood furnishings. Guests can use the photocopy services at the 24-hour front desk. The Christiansburg Budget Inn offers express check-in and check-out as well as free parking. Radford University is 10 minutes’ drive from the motel. Auburn Hills Golf Club is 5 miles away. This hotel is in Christiansburg, Virginia, a 10 minute drive from the Virginia Polytechnic Institute and State University. It features an indoor saltwater pool, an on-site restaurant, and free Wi-Fi. A 42-inch flat-screen cable TV and an iPod docking station is included in the modern guest rooms at Holiday Inn Christiansburg Blacksburg. A microwave, refrigerator, and coffee-making facilities are provided. Full-length mirrors and cardio equipment are part of the fitness room at this Christiansburg hotel. A business center is located off of the 24-hour lobby. The Christiansburg Holiday Inn’s on-site restaurant, Kem’s, serves American cuisine. It is open for breakfast, lunch, and dinner. The NRV Speedway is 5 miles from the Blacksburg Christiansburg Holiday Inn. Jefferson National Forest is less than a 20 minute drive away. Located just off Interstate 81, this Christiansburg motel is 12 miles from Virginia Tech University. It boasts an outdoor swimming pool and free Wi-Fi access in every room. The Super 8 Motel Christiansburg features rooms with cable TV and coffee-making facilities. They are decorated in light colours, wood furnishings, and carpeted flooring. Guests can enjoy a daily continental breakfast served in the lobby. 24-hour front desk services are also available at the Christiansburg Super 8. Radford University is 15 minutes’ drive from the motel. Hiking along Huckleberry Trail is 8 miles away. This Christiansburg motel is just 10 minutes’ drive from Virginia Tech University and boasts free Wi-Fi access in every room and a daily continental breakfast. Interstate 81 is half a mile away. Each guest room at the Super 8 Motel West features cable TV and an en suite bathroom. They are decorated in soft colours, wood furnishings, and carpeted flooring. Guests can take advantage of the 24-hour front desk services at the West Christiansburg Super 8. Free parking is also available. Radford University is 12 miles from the motel. Blacksburg Municipal Golf Course is 7 miles away. Located close to Interstate 81, this Christiansburg hotel offers free Wi-Fi, a seasonal outdoor pool, and rooms equipped with a seating area. Virginia Polytechnic Institute and State University is 10 miles away. Cable TV and a work desk is offered in each traditionally decorated room at Days Inn Christiansburg. Tea and coffee-making facilities are also included. Continental breakfast is served each morning and it features hot coffee or tea along with fresh fruit and pastries. A 24-hour reception is offered for guests along with fax and photocopying services. Newspapers are also available. Shopping and dining are a short distance away from the property. Dixie Caverns is 20 minutes’ drive away from Christiansburg Days Inn.